Koyra Number 6 was christened so by the British. The land was formed by destroying some of the Sundarbans, the largest mangrove forest in the world, and the newly formed villages were numbered for governing ease. In 2009, Cyclone Aila, the worst cyclone to hit Bangladesh since Cyclone Sidr in 2007, changed something in the nature of Koyra Number 6. All of its freshwater turned saline. “Bangladesh has been susceptible to cyclonic storms for centuries. Due to climate change, however, these cyclones have gotten more intense because they are dependent on the temperature of the sea,” said Saleemul Huq, director of the International Center for Climate Change and Development in Bangladesh. Water scarcity varies by season. In the monsoon, villagers tie large polythene sheets to four poles to collect rainwater. They also collect rain that drains from corrugated sheets on their roofs. “We have no other choice, and this is how we’re coping,” a man named Assadul Huq said to Sarkar. But for some, fresh water remains a luxury. “It costs 20 taka a day. I cannot afford it,” said Kukumoni Munda, a mother of two and wife of a night watchman. She walks more than half a mile each day to fetch saline water from a pond. On days that she is sick, her nine-year-old daughter does the fetching. The salary of a night watchman is estimated at about 1500 taka ($19) a month, often requiring nearly a whole day’s work. Drinking water highly concentrated with salt leads to hypertension and pre-eclampsia in pregnant women. Studies have also found the groundwater in these parts to be contaminated with arsenic, a known carcinogen. Understanding the role of the embankments is vital to understanding the tendency for flooding in this part of Bangladesh. They are based on a Dutch concept of water management and financed by loans from the Asian Development Bank and government of Bangladesh under programs such as KCERP (the Khulna Coastal Embankment Rehabilitation Project) and KJDRP (the Khulna-Jessore Drainage Rehabilitation Project). The improved drainage system was meant to reduce poverty, targeting around a million people, mostly farmers, between the towns of Jessore and Khulna. Some of the embankments are as much as two meters higher than the flood plain of cultivable land. Water that flows over the embankments from coastal or river flooding into the enclosures called polders, a Dutch term, has trouble draining back out. This dynamic reduces sediment flows to the delta after inland flooding, allowing the sea to further encroach, and leads to saline intrusion after flooding from the sea. “Earlier, without the polders, the water used to flow. Now it remains consistently saline because of water logging,” explained Datta. 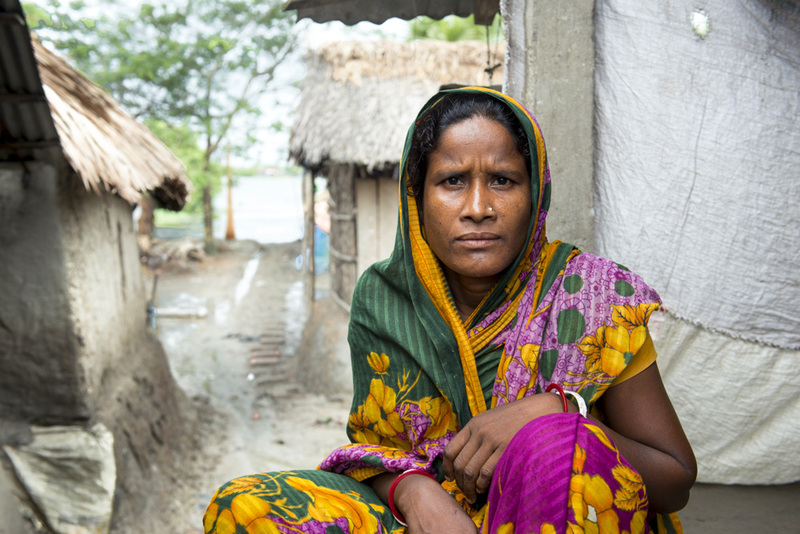 The salinity of the water supply, frequent cyclones, and the loss of livestock and land have led to a major shift in livelihoods in southwest Bangladesh. Farmers and fishermen alike have had to shift from their traditional occupations to shrimp farming. Portions of the existing embankments are broken by shrimp companies to allow saline water to enter shrimp farms, further preventing the possibility of rice or other crops being grown in the future and allowing for further encroachment of the shrimp farms. These conditions continue to force people to migrate away from their homes. “If we get another big cyclone, we’ll pack up and move to India,” said fisherman Asim Biswas, only half-jokingly. The original version of this article appeared at the Pulitzer Center on Crisis Reporting and was produced with the support of the Pulitzer Center. Nikita Sampath is an independent multimedia journalist focused on women’s issues, climate change, and social justice. Sources: Pulitzer Center on Crisis Reporting.